Feeling: I can’t believe I’m 34 weeks pregnantalready! I’m still pretty low on energy this week and am having to sleep as much as I possibly can. Small things are getting me really out of breath, which is frustrating, but at least it only started now, rather than earlier on in the pregnancy, I guess. I’m still getting quite a lot of swelling in my hands and feet and my wedding rings now won’t come on and off at all. One of my favourite places at the moment is sitting on the balcony with my feet in a bowl of cold water. I also went swimming this week on one of the hottest days, which was divine. It takes all the weight off and cools you down at the same time. We’re lucky enough to have a priory swimming pool in our town, so I think this may be another favourite spot over the coming weeks. Little R-M continues to be very active and I can still see it moving in my tummy quite often. Especially when I get in bed! Perfect timing little one. 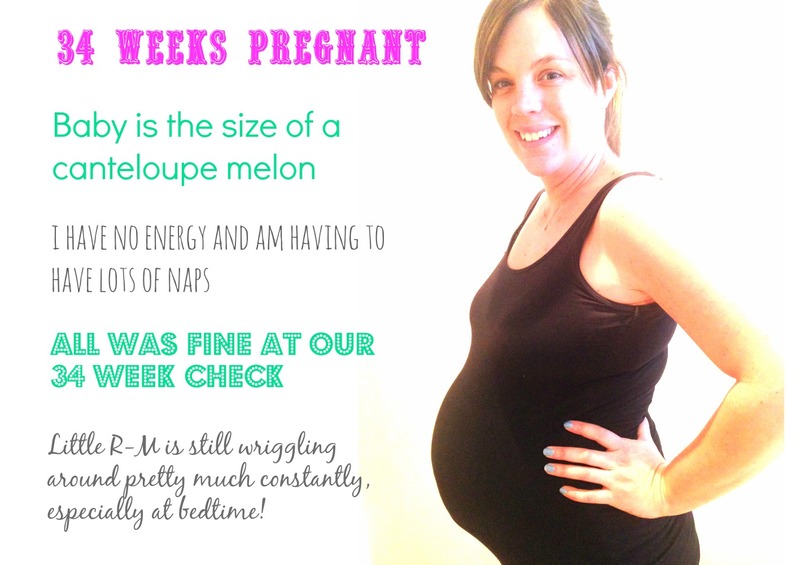 Appointments: I had my 34 week midwife appointment this week and all seems well. The heartbeat is strong, my urine and blood pressure are fine and Little R-M is measuring at 33cm, which is slightly behind, but it has grown in the last two weeks, so the midwife was not concerned. Looking: Much the same as last week I think..
Craving: Bottle Green Pomegranete and Elderflower cordial. I cannot get enough of it with sparkling water. Sleeping: I’m not great at sleeping in the heat, so it’s been a bit on and off this week as the temperatures rise, but I’m getting in bed earlier to make sure I get enough overall. Lovely update, you’re looking great!! Love swimming too it’s the best feeling now! Aww you are the same weeks as my sister. I hope your swelling reduces.